Join our team of volunteer stream monitors today! Do I need a background in science? No prior experience is necessary to become a volunteer. Volunteers are trained to use all monitoring methods. What do volunteer stream monitors do? Monitoring programs differ but most of our volunteers measure dissolve oxygen levels, water temperature, water clarity, and water velocity. Some volunteers also collect and identify macro-invertebrates – or aquatic insects that are visible without the use of magnification. A smaller number of our volunteers collect nutrient (including total phosphorus) samples to be mailed or delivered to state certified labs. All volunteers are expected to keep data records and to enter their stream monitoring data into a state-wide database maintained by the WDNR called the Surface Water Data Viewer. How do I become a volunteer stream monitor? The Rock River Coalition will provide all the necessary training and equipment. The Rock River Coalition stream monitoring coordinator schedules stream monitoring training workshops in the spring of each year. Weather permitting, these workshops take place stream-side so that volunteers learn and practice how to use all monitoring equipment. Participation in a stream monitoring training workshop usually requires a 5 hour commitment on one Saturday in the spring. How long does it take to monitor a stream? Volunteers need to commit to visiting a stream site once a month from April to October. Volunteers find that it takes approximately 2 hours to monitor. Do I need to know what stream I want to monitor? Some volunteers identify their own sites to monitor. Other sites are preselected by the Rock River Coalition stream monitoring coordinator. What support do I receive during the monitoring season? 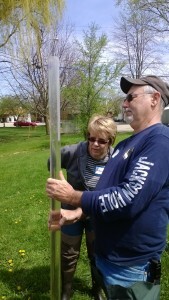 The Rock River Coalition is committed to supporting our volunteers throughout the monitoring season. Our volunteer stream monitoring coordinator will visit volunteers at their sites, answer volunteer questions with emails and telephone calls, and review all volunteer-collected data. How do I participate in a stream monitoring training? Our workshops are free. All you need to do is simply contact Nancy Sheehan, the volunteer stream monitoring coordinator, by email: nancy@rockrivercoalition.org. How much do training workshops? There is no fee for these workshops but donations are always welcome. hat happens if you miss the spring workshops? If it is early in the monitoring season, the volunteer stream monitoring coordinator can provide an individualized training. The volunteer stream monitoring coordinator keeps a roster of all who are interested volunteering—so it is never too late to send an email. 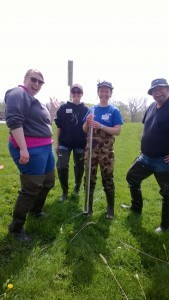 What do I learn at the stream monitoring training workshop? You will receive hands on instruction in the use of all stream monitoring equipment. You will have an opportunity to meet others interested in streams and lakes in the Basin. You will learn what makes a healthy stream habitat, how we impact streams and how our stream monitoring data is used by the Rock River Coalition partners.